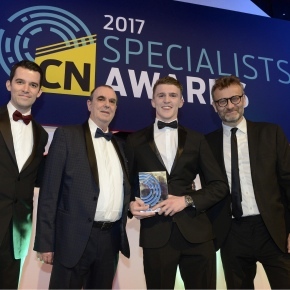 The Construction News Specialists Awards judges named Novus Property Solutions apprentice as Apprentice of the Year. Daniel Holdcroft has been an apprentice painter and decorator at Novus Property Solutions as well as a student at Stoke-on-Trent College, since 2013. Furthermore, Daniel was made the firm’s ambassador for apprentices for the whole year, seeing him attend skills talks and events to encourage the next generation of apprentices to take their first steps in the industry. Novus was praised for its level of support provided to its apprentices. Stuart Seddon, Novus Property Solutions’ chairman explained that the apprentice programme continues to play a vital role in the business, and Novus is incredibly proud of Daniel and all that he has achieved in such a short time.